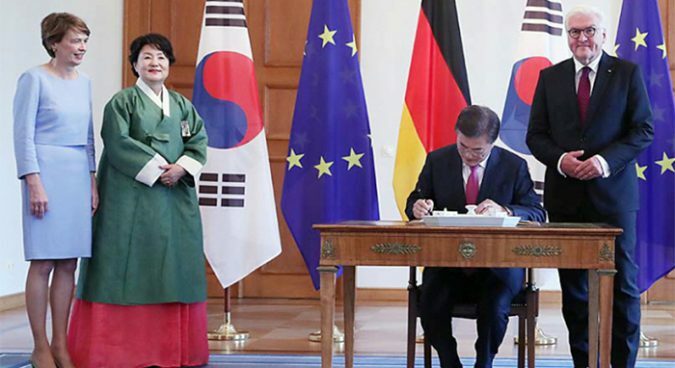 South Korean President Moon Jae-in gave a speech in Germany on Thursday, elaborating on his own version of the “Berlin Doctrine” espoused by former President Kim Dae-jung 17 years ago. 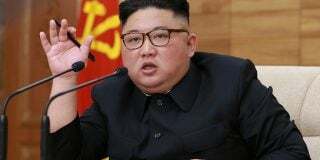 In the speech, he reiterated that Seoul remains committed to engaging Pyongyang, despite its recent intercontinental ballistic missile (ICBM) launch, but that its patience was wearing thin. Speaking ahead of a G20 summit in Hamburg, Moon said that it may be the “last chance for Pyongyang to make the right choice,” adding that Seoul may soon have no other option but to opt for harsh pressure unless the North stops its nuclear provocations. However, echoing comments the President made in his June 15 Speech, Moon reiterated his will to follow Kim Dae-jung’s path: saying he would meet with North Korean leader Kim Jong Un under the right circumstances. Based on the unofficial English version of the speech provided by the South Korean government, NK News partially translated and edited what we think are some of the most important lines. What follows is a partial translation – including only what NK News sees as the most important parts of Moon’s statement. For the full Korean version, check here. “Berlin, where we are today, is the very place where, 17 years ago, former President Kim Dae-jung introduced the ‘Berlin Doctrine’ which laid out a foundation for reconciliation and cooperation between South and North Korea. Moreover, the Altes Stadthaus is a historic site where the German Unification Treaty was negotiated. 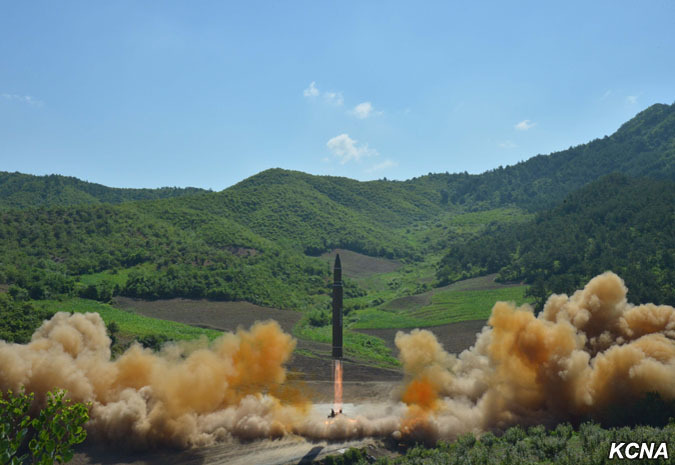 The biggest challenge that the Korean Peninsula is facing is the North Korean nuclear issue. 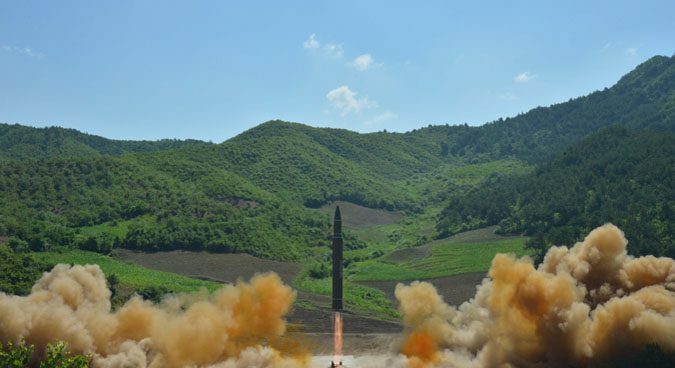 North Korea is continuing its nuclear and missile provocations and is threatening the peace on the Korean Peninsula, Northeast Asia, and furthermore, world peace. In particular, the missile provocation just two days ago was a very disappointing and a largely wrong decision. This choice by the North was reckless. I hope that North Korea will not cross the bridge of no return. North Korea must give up its nuclear and missile development and find a way in which it can cooperate with the international community. “Recently, Korea and the United States agreed on the overall direction that sanctions are a diplomatic tool and the denuclearization of the Korean Peninsula should be achieved in a peaceful manner. Two parties also made clear that we do not have a hostile policy towards North Korea. We affirmed that, together with the international community, we can provide a brighter future to North Korea, depending on its decision. Seoul and Washington also shared the view that in order to create a breakthrough of the current crisis on the Korean Peninsula, improvement in inter-Korean relations is vital. 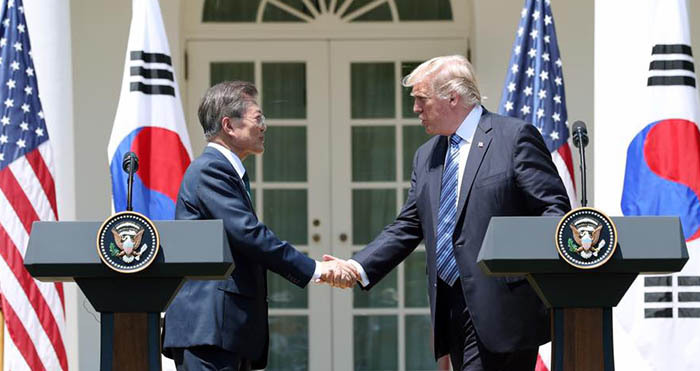 U.S. President Trump supported Seoul’s leading role in creating an environment conducive to the peaceful unification of the Korean Peninsula, and also supported my initiative to reopen inter-Korean dialogue. For quite some time, I have argued that South Korea must sit in the driver’s seat and lead Korean Peninsula-related issues based on cooperation with our neighbors. Now the conditions are finally being fostered. Now we are left with North Korea to make its decision. Whether it will come out to the forum for dialogue, or whether it will kick away this opportunity of dialogue that has been made, is only a decision that North Korea can make. “I look forward to and urge North Korea to accept this commitment of Seoul and the international community towards peace on the Korean Peninsula as a very significant and urgent signal. Now I would like to outline Seoul’s policy direction that will lead to dissolving the Cold War structure and establishing lasting peace on the Korean Peninsula. First, what we are pursuing is only peace. I clearly state the following: we do not wish for North Korea’s collapse, and will not work towards any kind of unification through absorption. Neither will we pursue an artificial unification. Second, Seoul will pursue the denuclearization of the Korean Peninsula that guarantees the security of the North Korean regime. 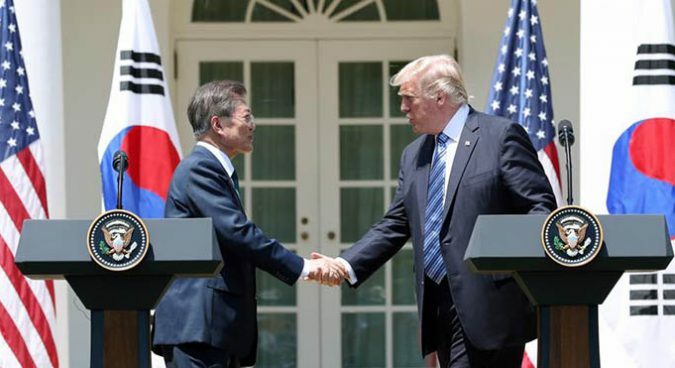 Seoul, in cooperation with the international community, will work towards a comprehensive solution to the current issues on the Korean Peninsula and Northeast Asia, including the complete dismantlement of North Korea’s nuclear program and establishing a peace regime, easing North Korea’s security and economic concerns, and improving North Korea-U.S. and North Korea-Japan relations. However, it takes two to tango. This is only possible when North Korea fully stops its nuclear provocations and comes out to the forum of bilateral and multilateral dialogue on denuclearization. Third, Seoul will work towards establishing a permanent peace regime. Fourth, Seoul will work towards drawing a new economic map on the Korean Peninsula. Fifth, Seoul will consistently pursue nonpolitical exchange and cooperation projects by separating it from the political and military situation. In both Koreas, there are separated families who can no longer visit their hometown due to the division and war. 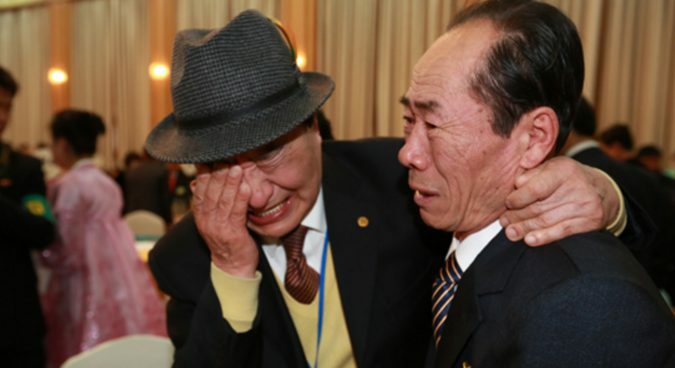 Among the separated family members who have applied to the Korean Government to meet their families in the North, there are more than 60,000 people who are still alive and their average age is 81 years old. The situation in North Korea should be the same. “The government and I are ready to implement while holding firmly to these policy directions. Seoul and Pyongyang need to work hand-in-hand and make a breakthrough in realizing peace on the Korean Peninsula. I suggest to North Korea that we first start with what is easy. First, let us solve the pressing humanitarian issue. This year marks the tenth anniversary of the October 4 Declaration. Also, Chuseok, which is one of our nation’s greatest traditional holidays, falls on October 4 this year. If the family reunion event can be held on this day when these two meaningful anniversaries overlap, it will be a meaningful start respecting and observing the agreement already made between the South and the North. If North Korea is ready to take one step further, I suggest that we also include visiting the ancestral graves for this year’s family reunion event. If North Korea is not ready immediately, our side will allow and open North Korean separated family members to visit their hometown and ancestral graves in the South. 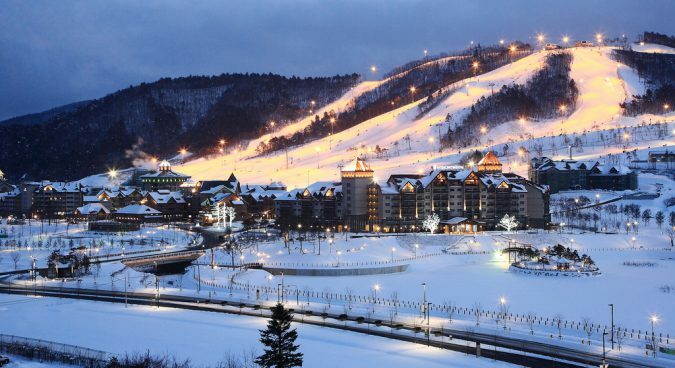 “Second, let us make the Pyeongchang Winter Olympics an ‘Olympics of Peace’ with the participation of the North. 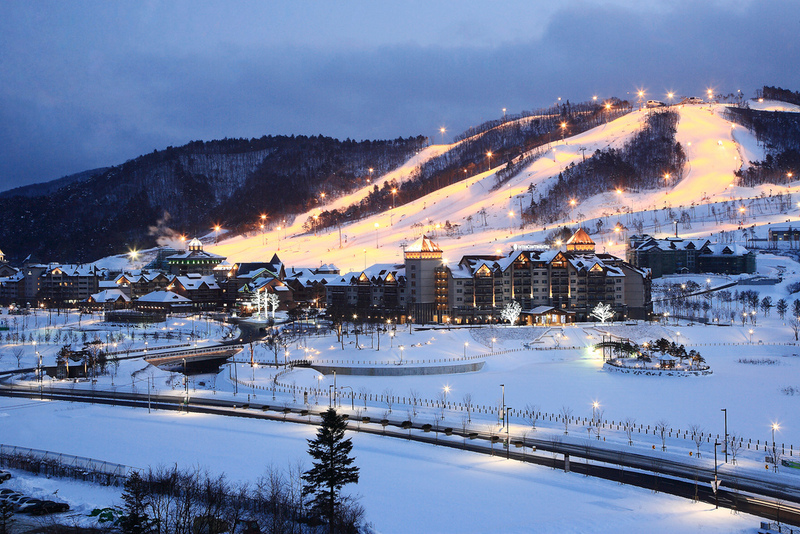 In February 2018, the Winter Olympics will be held in Pyeongchang, Korea, which is only 100 km away from the military demarcation line. Two years later in 2020, the Summer Olympics will be held in Tokyo, and in 2022, the Winter Olympics will be held in Beijing. 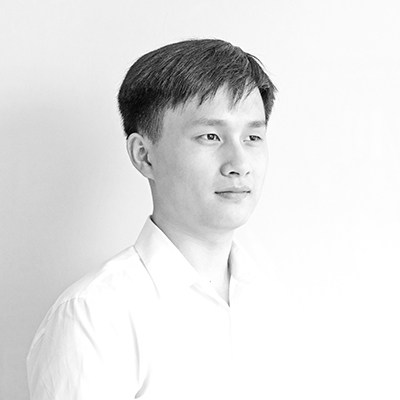 Seoul would like to suggest to North Korea to utilize these series of precious events held in Asia as an opportunity for building peace on the Korean Peninsula, in Northeast Asia, and the world. Third, let us mutually halt acts of hostility around the Military Demarcation Line (MDL). Even at this moment, a war without gunfire continues along the MDL on the Korean Peninsula. 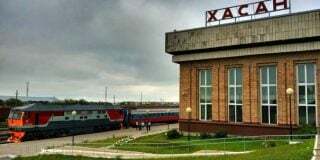 The escalation of military tension between the two militaries remains unchanged. July 27 this year marks the 64th anniversary of the Armistice Agreement. If the two Koreas, starting this day, stop all acts of hostility that escalate military tension on the MDL, it will provide a meaningful opportunity to ease tensions between the two Koreas. Fourth, inter-Korean dialogue is necessary for peace on the Korean Peninsula and South-North cooperation. 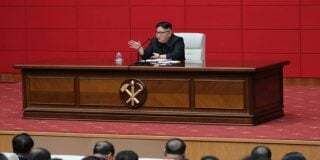 I am ready to meet with Chairman Kim Jong Un of North Korea at any time at any place, if the conditions are met and if it will provide an opportunity to transform the tension and confrontation on the Korean Peninsula. We can place on the dialogue table all issues of interest between the South and the North, including the nuclear issue and the peace treaty, and discuss peace on the Korean Peninsula and inter-Korean cooperation. The Republic of Korea will also surely realize a peaceful Korean Peninsula through the power of its mature democracy. Subscribe to read the remaining 1629 words of this article.